PANTONE 4 COFFEE (4C), a t-shirt of funny, graphic, cool, vintage, retro, vector, typography, geek, parody, colour, naf4d, designer, color, drink, match, type, espresso, coffee, latte, cappuccino, guide, five, and pantone goodness. 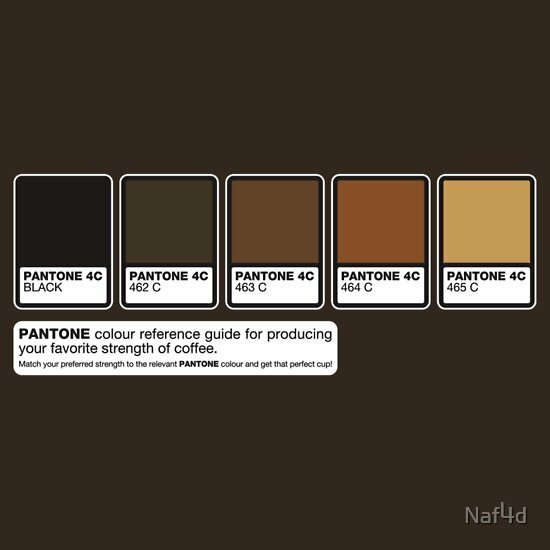 PANTONE colour reference guide for producing your favorite strength of coffee. Match your preferred strength to the relevant PANTONE colour and get that perfect cup every time.